Spring runoff thundered through the sunlight-dappled creek. Stitch hurled in, black tail disappearing into the culvert under the dirt road. Savannah sobbed as we watched, helpless. Downstream, we cheered his exhausted, lumbering climb out. “What a ride!” his eyes exclaimed. 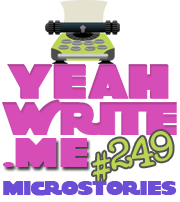 Microstories must answer the weekly contest question in exactly 42 words. It’s harder than you’d think! My dog loves the water too…scares me to death sometimes. A great story told in sparse words.